My predictors are degree or exposure and time of test. Participants were exposed to the material and then were tested in 12 items at each delay. These time delays were within subjects, so I guess is repeated measures. When I did the Bayesian repeated measures anova everything was ok. Then I did the frequentist version and got a legend saying: "Mauchly´s test of sphericity indicates the assumption of sphericity is violated (p < .05)" under the within subjects effects. If this assumption is violated for the frequentist version, does it mean I shouldn't use the Bayesian one either? 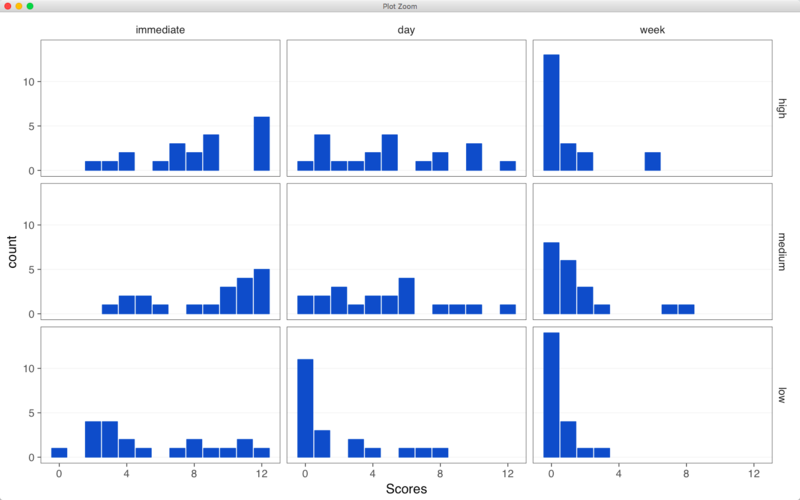 I could do a logistic regression also and instead of using the score as continuous, use it as a binomial variable. However, I think I cannot do that in JASP or in BayesFactor. I also tried to do it in BayesFactor with anovaBF but the Levene´s test was significant, and I think that one is for continuous variables. I still don't fully understand if my dependent variable is continuous or count data or what. I've read some posts in which you recommend the brms package, but you also say that it won't give us the test and I don't understand what that means. Thank you. Yeah, well, with these kinds of nonstandard data I would recommend a more complex analysis. First of all, your data are binomial on the subject level, as you mention. Second, the effect of delay will be to reduce performance, so there's an ordinal constraint there. There are probably also item effects. The frequentist warning suggests a problem with the standard analysis, and I believe this is also relevant for the Bayesian analysis. I suggest contacting a statistician or quantitative methodologist who can advise you on the modeling.